How long have you been riding horses? : My whole life really started riding as a child and grew up on a dairy farm in Newfoundland. 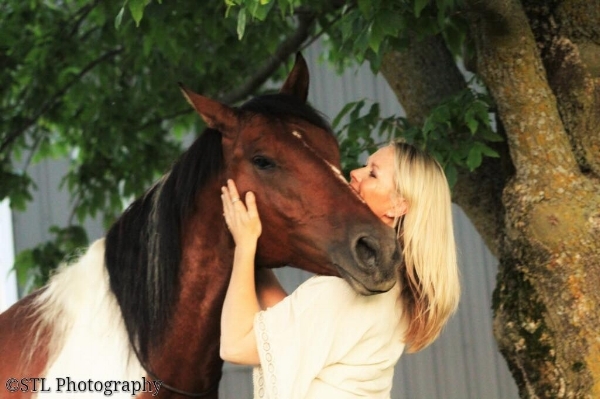 As an adult later in life I got my first horse and began competing in Western and English disciplines with my horse Maverick, working towards my certification as a Equestrian Canada Coach. Do you own horses? Tell us about them! : Yes Maverick is my first horse my Appaloosa he's now 21 years old and he is my "silent hero" for so many reasons. We have a third gelding named Justus he's my daughter Callie's horse and he is quite special he is full of life and love ... he is a blessing in our tiny herd They are all very loved. What are your motivations for competing in the Gobi Desert Cup? : My daughter she diagnosed with a rare skin disease last November and started chemo in January its been a struggle for her and I want to show her that you can over come anything with time and so I dedicated the Race to The Children's Hospital of Eastern Ontario so I can raise money for the hospital and to show all children theres times in life where things are tough but there will always be an end to the hard times so endurance what you must and love to live and don't ever quit. I was the First ever Western Performer to showcase the western discipline highlighting my philosophy of Liberty Horsemanship for the RCMP ( Royal Canadian Mounted Police) Sunset Ceremonies in Ottawa, Ontario out nations capital. What are your long-term goals in the sport? : Long term would be making an impact with my horsemanship and philosophy as an educator and mentor for my community. I am also planning on getting back to the sport of reining competitively. What are you looking forward to most in Mongolia? : The Horses of course ! I Cannot wait to see the horses. My sister Danielle asked me once "any chances we can do a vacation somewhere for something other than horses?" my response was laughter I can't imagine going anywhere where there are no horses. I'm also really looking forward to meeting the other teams the riders the staff and crew the vets ! Everyone involved in this journey can't wait to see the Gobi Desert and just be there! What do you fear most about the race? : Fear is a healthy feeling and a natural one. My fear is getting sick and not being able to continue on in the race. What do you feel are your main strengths in competing for the Gobi Desert Cup? : My Horsemanship and the passion I have that will carry me to the finish line. What do you need to improve before the race? : My riding ... I have spent all my time since I found out about going literally day and night fundraising to get the money to enter the race and did not spend as much time riding as I would have liked to so I could be prepared for the journey but praying it will still be okay. What is your training plan? : I have done some 20 km rides here and there also walking and training I have min riding time in but planning on trying to ride a lot more before going I work with horses everyday training and starting young horses, teach clinics in Horsemanship and also teach private to clients as well I am not an endurance racer but have a great respect for the sport and I'm fortunate that I will get some mentoring hours in with some professional racers to understand the sport in more depth before heading to Mongolia. Why should others sign up for the Gobi Desert Cup? : It's an opportunity of a lifetime and if you have opportunity you have growth! What would you consider a successful ride? : To me everyday is the "best ride ever" doesn't matter if its my clients horse my own or the horses I will have during the 480km race to me the success will be having "more horse" from my horses that I ride each day and having them successful. Warmly Lorie Duff ~ "Ride Together"